2019 We Compare All the No Contract Plans from Singapore Telcos to Find the Best for You! Good things come in pairs! 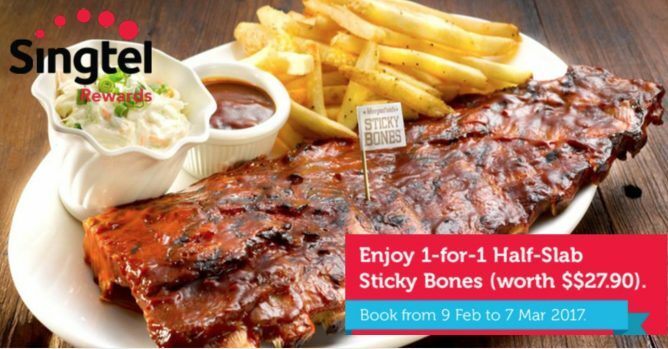 Exclusively for Singtel customers, enjoy 1-for-1 Half-Slab Sticky Bones (worth $27.90) at Morganfield's, which serves good ol’ fashioned, prime pork ribs slow-cooked and smoked to tender mouth-watering perfection. Limited sets available, while stocks last. Hurry book and dine with HungryGoWhere today! Reservations must be made through hungrygowhere.com/singtel & Singtel customers must select “Singtel Exclusive" promotion. Promotion is valid from 9 February to 7 March 2017, Sundays to Thursdays only. Not valid on 14th Feb 2017. Booking size of 2 – 10 persons only. Limited sets only, while stocks last. No splitting of bill allowed. Not valid with other discounts, promotions, vouchers. The restaurant reserves the rights to amend any T&Cs without prior notice. Book this deal now here! Rooted in the spirit of Southern hospitality, this updated American restaurant and bar is best known for its signature Sticky Bones - mouth-watering pork ribs slow-cooked to tender perfection. Our ribs are slowly smoked with hickory wood to give the meat what we feel is the best BBQ flavor around. 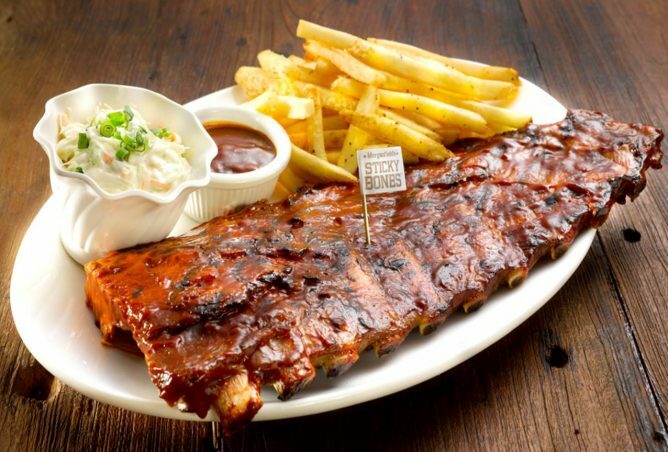 Our tender, slow-cooked, off-the-bone pork ribs will definitely make you crave for more! Garlic BBQ Spare Ribs (half slab at $27.90++) Loaded with garlicky goodness, tangy, sweet & spicy. This succulent concoction will satisfy all your garlic cravings. Served with French Fries & Coleslaw. Spicy Asian BBQ Spare Ribs (half slab at $27.90++)Our signature BBQ sauce mixed with Oriental spices & chilli flakes. This bombastic, fantastic, climatic, galactic flavor will bring you to the moon & back. Served with French Fries & Garden Salad. Smoked Peppercorn Spare Ribs (half slab at $27.90++)If you like the spicy flavour of black pepper, you'll definitely love these ribs! The aroma from the ribs as they slowly cook will put your patience to the test! Served with Red Skin Mashed Potatoes & Garden Veggies. Hickory BBQ Spare Ribs (half slab at $27.90++)The most tender, succulent & hearty pork ribs in town! Slow-cooked with hickory smoke, grilled & basted with Hickory BBQ sauce. Served with French Fries & Coleslaw. Honey Rum Sticky Bones (half slab at $29.90++)Sweet & Sticky Honey Rum sauce, made with delicious pineapples & aromatic honey, glazed onto our signature slow-smoked tender pork ribs. Next: [Kandee] Denim quilted eye lash backpack ! Email [email protected] to order …..